The Australian High Commission on Tuesday organized a send-off party for Team Ghana ahead of their departure to Australia for pre-games preparation. Team Ghana is made up of 72 Athletes from 12 Disciplines. Athletics,Badminton,Boxing,Cycling,Hockey,Swimming,Shooting,Table Tennis,Weightlifting,Para-Cycling, Para Power Lifting and Para Athletics. Weightlifters, table tennis players, swimmers, boxers, cyclists & the hockey team were at the event as well as members of the National Sports Authority (NSA) and the Ghana Olympic Committee (GOC). 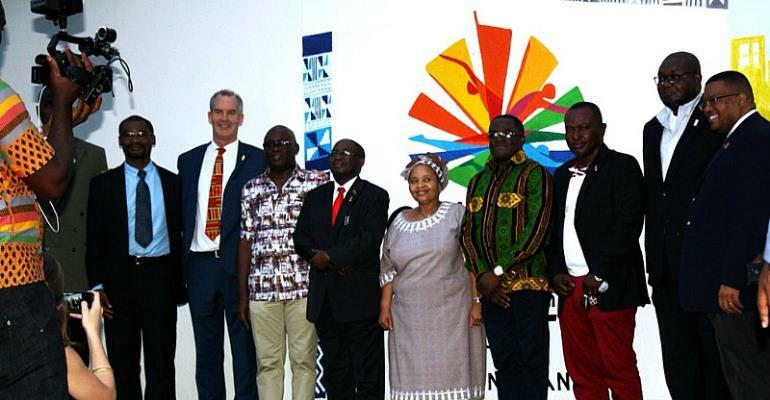 “Ghana’s athletes at our farewell send-off for the Gold Coast Commonwealth Games! Best of luck in. Can’t wait to celebrate yours on your return! “What a night for Ghanaian sports! Over 60 athletes from 12 different sports joined us to celebrate the team’s departure for kicking off in 40 days! Thanks to Ministry of Youth & Sports, coaches, sponsors & Commonwealth High Commissioners for supporting” said HE Andrew Barnes, Australian High Commissioner to Ghana who wished the team success. President of the GOC, Ben Nunoo Mensah advised the athletes to be disciplined and do their best to win medals. He urged companies in Ghana to support the team. Out of the 72 athletes, the national female hockey team is the highest with 18 players, followed by the national athletics team with 16 athletes, made up of eight male and eight female athletes. According to the breakdown of the team size, the national swimming team would be represented by four athletes made up of two male and two female swimmers. The shooting team would have one male and one female while badminton would have six players made up of three male and three female players, with boxing having seven, made up of six males and a female boxer. Three male cyclists would represent the country while table tennis would have six, made up three males and three females, with three male para-athletes and a male para-powerlifter. The country would have two male para-cyclists and four weightlifters made up of three males and a female lifter. Sammy Heywood Okine An Ace Sports Journalist ExtraOrdinary. He is also a Manager, Promoter and Organiser of Sports.